A true Twintip Shape with aggressive Sidecut Radius and blunt Tips – set up in a TriAx Glass/Wood AnchorCoreTechnology „ACT“ – stands for extremely thin Tips and minimum Swingweight. Deep Sidecut Radius allows for aggressive Cuts, Turns and Carving. „ACT“ allows precise Flex in every Direction – this gives the Board unexpected Dynamic Pop. Edge damping through recycled ABS Sidewall and rubber. Three different Rockerlines – Low Camber (sporty and still quick in turning), Double Camber (floaty and centred feeling), Smart Rocker (floaty, surfy, forgiving, quick edge to edge). ACT also offers great dampening on rough and hard conditions, and will the rider always feel a little more comfortable at speed. The Emcee Eco Earthkeeper comes with an original Earthkeepers Art Image by Maurice Spees with slightly shining through inner life – the sales support Earthkeepers activities. Sintered Iso 7500 Running Base for the perfect slide. A completely upgraded directional Freerider with priorities on float, precision, durability and comfort, even in situations when it gets uncomfortable. Set up with TriAx Basalt/Wood AnchorCoreTechnology „ACT“. 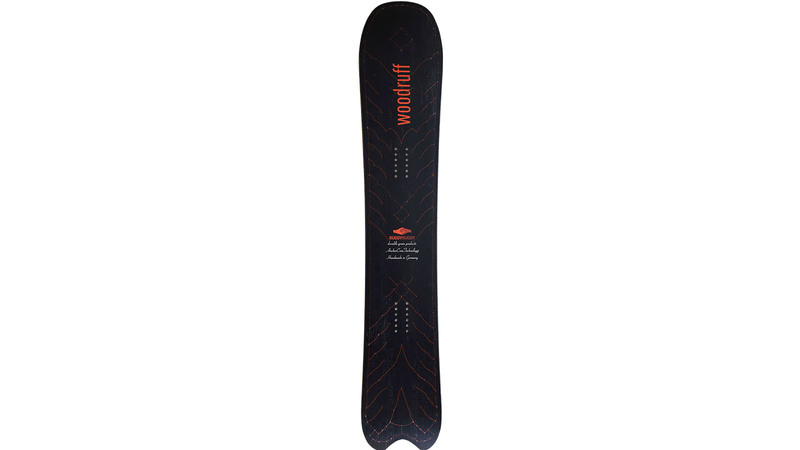 The Woody is surprisingly lively and loves to carve on slopes – but you will feel it’s true qualities when you let it run through unknown surface like a Shinkansen. The Basalt „ACT“ demands a powerful rider, who soon will ride to new horizons. Edge damping through recycled ABS Sidewall and rubber. Two Rockerlines shall help, to meet the individual preferences – an S-Rocker for early lift and maximum Edge hold on hard ground, and a true Surf Rocker, if lift, float and easy turning on fluff is a priority. ACT also offers great dampening on rough and hard conditions, and will the rider always feel a little more comfortable at speed. The Woodruff Ltd comes in a transparent skin, so that You can visually see the Basalt Fibre Strings diving in the Anchor Points – doing their job – no Schnickschnack around – pure function with maximum sustainability in 3 different optic variations! The Touring mode offers magne traction at the reversed outer edges, as well as Karakoram Connectors. The Woodruff Eco split comes in a transparent skin, so that You can visually see the inner life of our ACT construction – not hidden any blems or misfits by graphic cover! – pure function with maximum sustainability in 3 different optic variations! Higher dynamics in every necessary position and direction = more Pop, precise Flex – even torsional. Our main ingredients are just local wood (Eshwood, Poplar), bio epoxy and mineral glass or basalt layers. Parts are recycled sidewall material, sintered Base, or even recycled sintered Base. We do not need any synthetic and harmful reinforcement or dampening parts in our Twintips. The new Woodruff 2.0 and the Woodruff 2.0 Split have some additional Eshe reinforcement and PU damping in the tips. In general, we do not use any oversea raw materials–use only mineral layers (glass or basalt), and glue with Bio Epoxy. All our production steps are made in-house – even the mould construction. We build our boards in our own factory in „Erzgebirge“, Germany – near Chemnitz. The reason we started our own production wasthat the only existing company that managed to produce „ACT“, was GST in Austria. Since GST closed, there have not been to many choices, to continue the production of Anchored Sandwiches. We had the luck, to find an investor (now our CEO), who was as convinced from the potential of „ACT“. With his support we have been able, to buy production parts from GST, and so.. .. we started our own production in May 2017. This guarantees independence and that we can stay focused on our goal, to minimize the ecologic footprint and create a superior product at the same time. As our boards are really different to the competition – production efforts lead the durability of boards to being much higher – our pricing is more in the upper region. We start from 500,- without anchors but only premium parts and our anchored Boards begin at 619,- € – so I would say, middle to Premium. This may sound high, but compared to the competition, the customer gets a lot of extra value: the sustainable production chain, support of local purchasing power, a board, that will not lose flex character through years (we offer 5 years warranty!). People are open to investing in superior qualities and sustainability is a very important reason with raising potential. This is currently the crux – our goal is, to harm our habitat as little as possible, and at the same time, building boards as good as they only can be – which means, they last long, and they work perfectly long – this explains, that we are focusing more in real working features and less in marketing gimmicks. 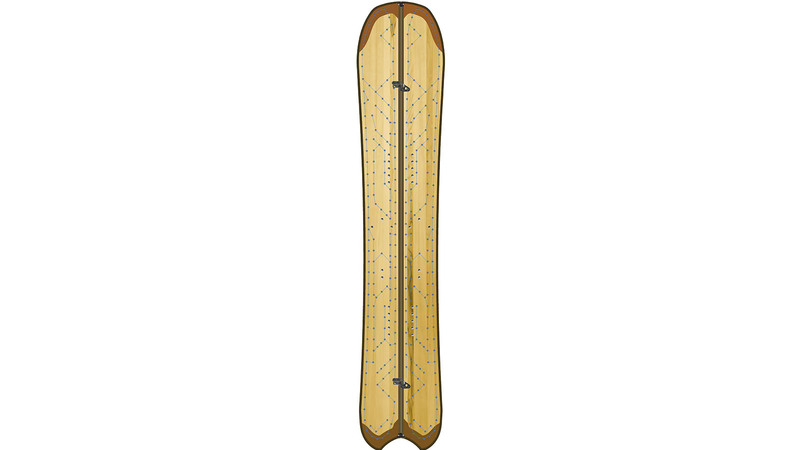 For 19/20, our biggest steps are seen in the directional freeride concept „Woodruff“, that is also available in XL widths, as well as Splitboards, based on that. 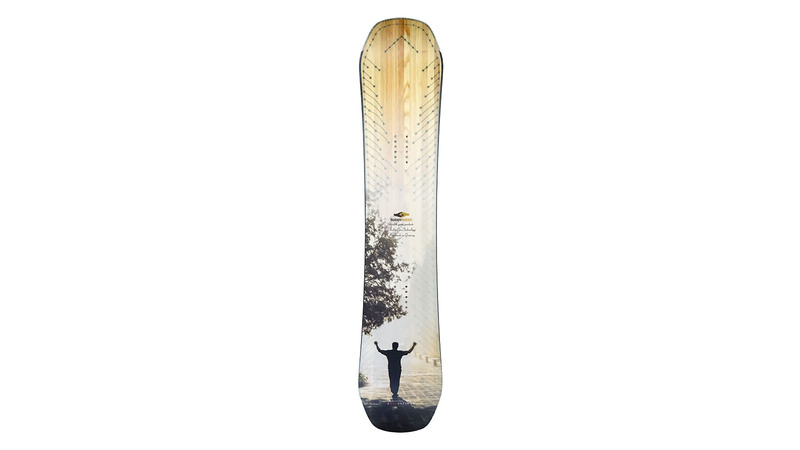 In the coming season, the customer will have the choice, to choose his graphic theme for every board from the line. We offer 3 themes: „ Traditional Tech“ which opens the view into our boards, „Photo Art“ from Earthkeeper Activist Maurice Spees, and „Custom“: here, the customer gets his individual graphic design on the topsheet. Our most important story is sustainability and value. Sustainability through local production, short distances, natural and mineral layers, core materials and glue, outstanding durability – value through durability, superior outstanding board character, offering local working space.